Friday. Shew, this week feels a little like it has flown but on the other hand, Friday could not have come soon enough! I really feel I am lacking in the sleeping and reading department lately ... haha. This week was pretty cool. *tries to remember* Monday was uneventful, except for the fact that I finally got myself back to gym. I've been successfully avoiding it for ages now ... I know we started off well (I think for maybe a week) when we got back from our Cape Roadtrip, but being winter and having a new puppy kinda put things out ... that and, of course, the fact that I hate going to gym - haha. 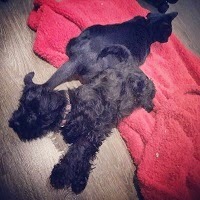 Once Pepper arrived and I was taking her walking every day after work, I ended up with a bit of a conundrum. I wanted to gym, but if I went, then she would miss out on walking since it gets dark so early at the moment ... and walking her is insufficient exercise (for me) since she can only go like 200m at the moment (apparently it'll get further as she gets older, something to do with leg muscles?). Anyhoo, so I figured to get me into a routine and to still be able to walk Pepper, I would go after work, but only do 30-40min and be home with enough time before sunset. It's worked out perfectly this week (I only skipped Wednesday). And even when I try to talk myself out of going, I try to remind myself it's only 30min ... here's hoping that as the sun starts setting later I can ramp it up :) Baby steps. On Tuesday I went to SCM Dinner. We celebrated the birthday boy, again. We've recently started a new thing where the person who's birthday was last (me) organises the birthday dessert for the next person (him). So I went and got a few of his favourite things. 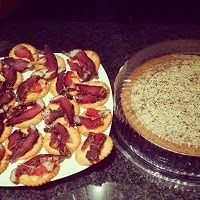 It is such a cool idea :) We did his trademark Salticrax with butter & biltong to start and had milk tart for dessert. On Wednesday, @Sascha_with_a_C came over for dinner. 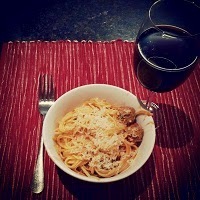 She'd been keen to make spaghetti & meatballs so offered to cook for us this time :) Was an absolutely superb evening! The food was delish and I made gluhwein and we provided the dessert. And The Trucker made banana bread :) Yum. Yesterday was another quiet evening in. We finished watching Californication as well ... meh, somehow season finales are only good when it doesn't conclude the whole series. But, I guess ending an entire series is difficult.